Two Australian members of a graves registration unit (wearing slouch hats and standing on the right) supervising Japanese POWs digging graves in the Kanburi Allied POW cemetery. 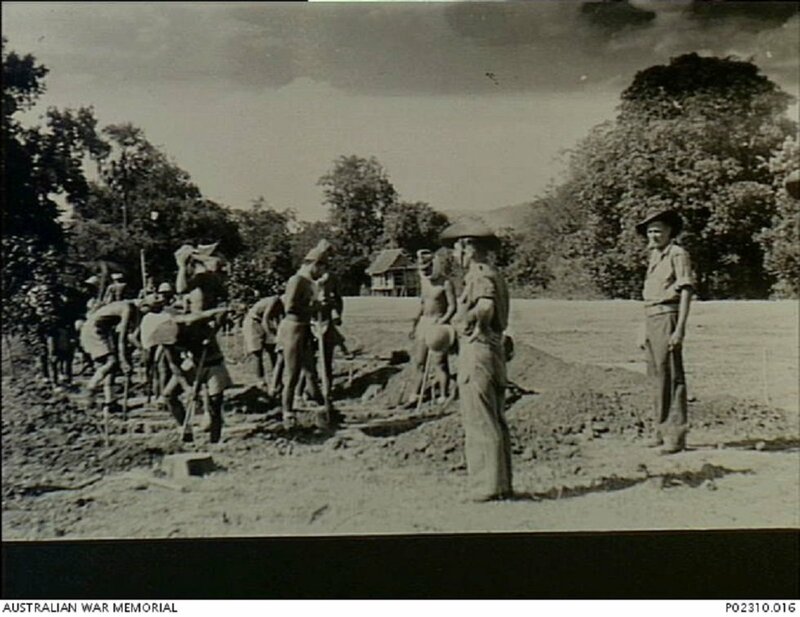 Australian servicemen who died during the construction of the Burma-Siam Railway and other parts of Thailand were exhumed from their jungle graves and re-interred here, September 1945. Image courtesy of Jack Holder Leemon, Australian War Memorial. 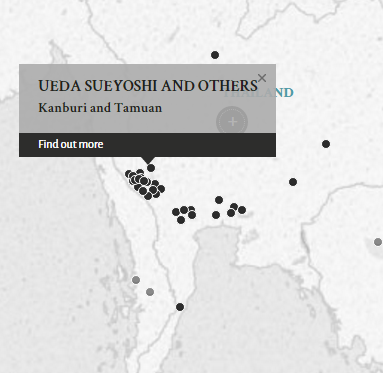 Sergeant Major Ueda Sueyoshi, Warrant Officer Hashimoto Hiyoshi, Sergeant Ishibashi Kinji, and civilian interpreter Takahashi Yauchi were all former Kempeitai personnel based in Kanburi and Tamuan, Siam. They were charged with the ill-treatment of British, American, and Dutch POWs interned at Kanburi Kempei-Tai HQ. The POWs were suspected of being in possession of and circulating war news and also of smuggling money into the camp. It was alleged that several of the POWs were interrogated by Ueda, Hashimoto, Ishibashi and Takahashi and because they would not give the answers which the Japanese wanted, they were beaten, given water and finger torture, jujitsued, and generally ill-treated. One of the victims in this trial, Lieutenant Colonel H.H. Lily, was the inspiration behind Sir Alec Guinness's character in the classic film, The Bridge On The River Kwai. It would also appear that Takahashi was a man who was very uncooperative and difficult to work with. The Defence counsel had in fact, at one point, threatened to drop Takahashi's case. Takahashi also claimed British nationality in addition to Japanese nationality, stating that having gone to live in Canada in 1911, he was nationalised there in 1920 until he returned to Japan in 1936 and was made to serve in the army in 1944. The Brigadier of the South East Asia Land Forces opined that having returned to his country of birth (Japan), Takahashi reverted to his native domicile and natural character, and was no longer entitled to claim privilege as a British subject. Ueda, Sueyoshi. Sergeant Major. From Japanese military. From Japan. Guilty. 5 years' imprisonment. Sentence confirmed. Hashimoto, Hiyoshi. Warrant Officer. From Japanese military. From Japan. Guilty. 1 year's imprisonment. Sentence confirmed. Ishibashi, Kinji. Sergeant. From Japanese military. From Japan. Guilty. 4 years' imprisonment. Sentence confirmed. Takahashi, Yauichi. Civilian. From Japan. Guilty. 7 years' imprisonment. Sentence confirmed. Seagroatt, L.E.G. Major. From British military. Nakamura, Takeshi. Civilian. LLB. Barrister of the Supreme Court Tokyo. Lead Counsel. Hokabe, Tadamitsu. Civilian. Barrister of the Supreme Court Tokyo. Co-Counsel.